I remember seeing it in person in the LFL Archive exhibit back at Celebration3, and being very impressed by the wood carving...and well within my capabilities. My problem is, I have no idea how big the dang thing is. I stitched a few pictures together and it looks to be roughly as tall as the Chewie--who I believe is 7 feet 3 inches or so. If that's the case, the wookiee in the screencap must be a runt (if we assume the shield prop is 7.5' then he's a bit less than 6')!...I think this effect is a result of Lucas putting a regular-size person in the costume and having him hold a prop made for a character 7'+. 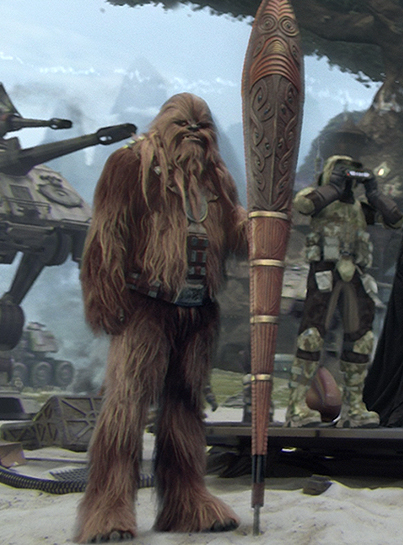 If we assume that the wookiee with the shield is meant to be a regular size (7'+), then the shield is almost 9'! 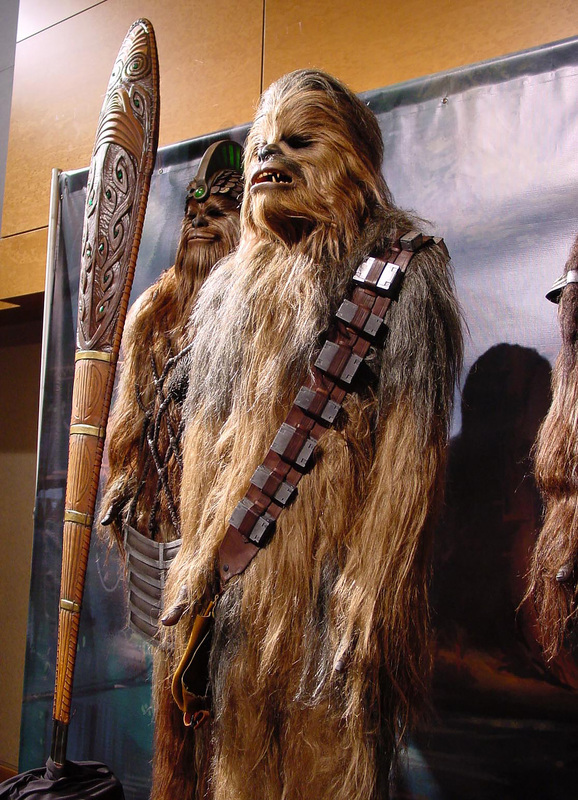 While I would like to make it truly wookiee-scaled, I think I should stick with copying the real-world artifact from the exhibit. The Visual Dictionary has a great straight-on image, but there's nothing for scale. Can anyone direct me to any resources to help find some dimensions on this thing? Has anyone ever contacted the LFL Archives to request a measurement of a prop? All the props were built life sized for the movie and there were now average sized people stand ins. 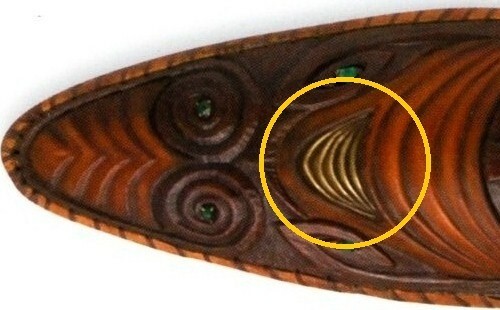 If it helps, dont think of the piece as a shield, but more like a forearm bracer. Or more like captain americas sheilds in infinity war. Also its not carved in wood. It was sculpted in clay and then cast. After doing some more squinting and figuring, I've settled on 7.5 feet for the shield height. Also its not carved in wood. It was sculpted in clay and then cast. Interesting! Though I'm not surprised (it's a background prop and that makes sense from a production-economy standpoint), do you have a source for that info? Regardless, I'll be carving mine--or at least a large portion of it; I'm thinking about producing a partial battledamaged shield as a 'found artifact'. "The Wookiee language contains over 150 words for wood, many of them devoted to grain, moisture content, and factors that can influence warping, twisting, and checking. Shipboard logs cite instances of Wookiees effecting temporary repairs of starship drives using pieces of wood. Commentators have classified even their blasters as "art," and yet the language has no word for "artist." Wookiees view their innate talents for carving and engraving as mere survival skills." (SW Complete Visual Dictionary, p. 180. And was able to cast a mockup! 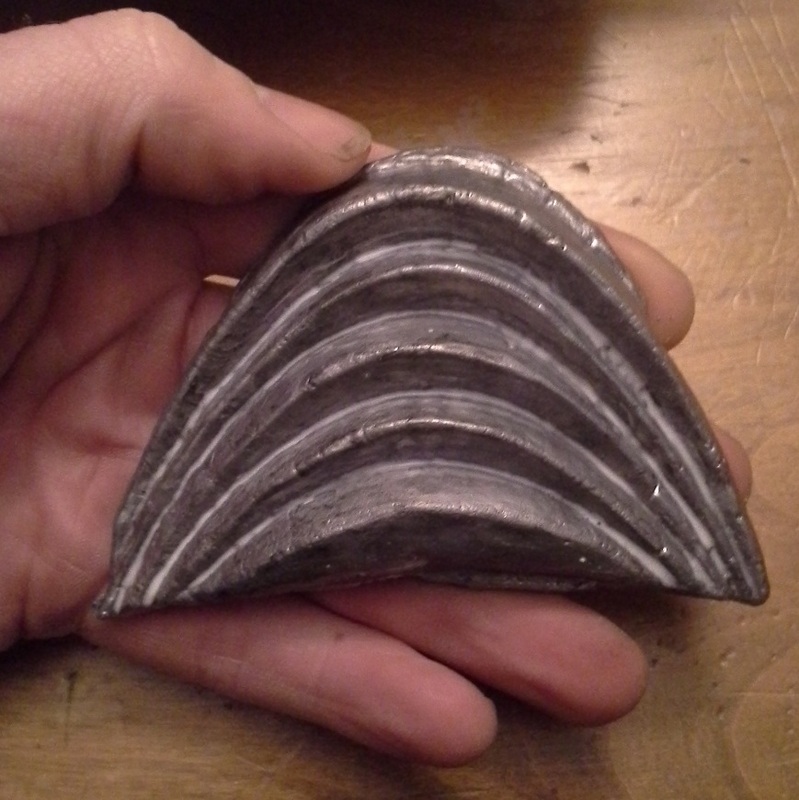 This will be cleaned up and eventually recast in bronze by a metallurgist friend of mine. Making progress!